A Feast for the Arts committee members Joel Cox, Alexia Jurschak, Maureen Riordan and Patti Thompson worked with area chefs to raise funds for programming at the Vilar Performing Arts Center. 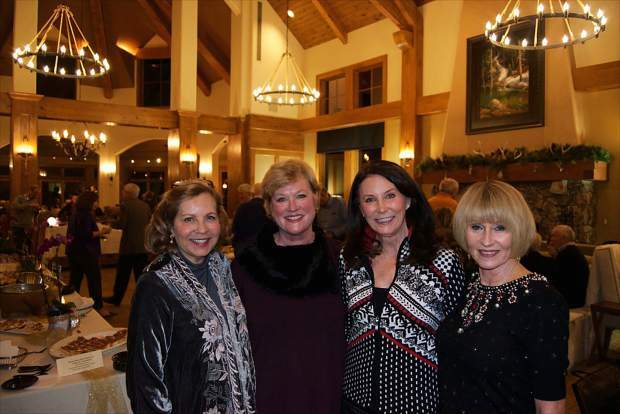 On Wednesday evening at the Beaver Creek Club Mountain Clubhouse, the Vilar Performing Arts Center Guild held its annual event, A Feast for the Arts, to support ongoing programming. It was an evening of warmth, community, hospitality and delicious tastings from local chefs and restaurants. A heartfelt thank-you went out to the nearly 20 chefs who donated tastings for the event. Alexia Jurschak, who works on the VPAC Guild executive committee, welcomed guests to the event. “We are very happy that you are all here with us tonight,” she said. “I wanted to say a little bit about what our role is for the Vilar Center. Our mission is to raise awareness of the center throughout our valley community. We raise funds to help underwrite performances and series at the center. Jurschak then introduced Pam Elsner, the new president of the VPAC Guild. Elsner greeted guests and thanked the organizing committee. “There are so many people to thank this evening — Alexia Jurschak, Maureen Riordan (who has chaired the committee for the event), Joel Cox and Patti Thompson,” she said. Elsner thanked the Guild members for helping to organize the food for the event and Pat Hammon and Doris Dewton for their tireless contributions to the Guild. She then invited interested parties to sign up to join the VPAC Guild. “We have a lot that we do to help the community and the Vilar Center, and we need your help,” Elsner said. Diane and Dave Piccoli, of Rhode Island, were staying at St. James Place and decided to attend A Feast for the Arts. Piccoli commented on how delicious the tastings were and especially liked chef Brian Ackerman’s applewood-smoked bacon-wrapped date with blue cheese filling from Splendido at the Chateau at Beaver Creek. For more information on joining the Guild or volunteering at VPAC, visit http://www.vvf.org.